Information on residential real estate markets has dominated the news over the past few days. 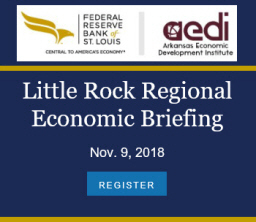 When it comes to evaluating the housing markets in Arkansas, recent reports from various sources show a consistent picture of recent trends, but the outlook is very uncertain. The Arkansas Realtors Association (ARA) released statistics this week showing that June home sales were up slightly over the previous year, but down from the previous month. As shown in Chart 1 below, housing sales follow a recurring seasonal pattern, with the summer months tending to have higher sales than winter months. July is often the peak sales months of the year, but so far this year, sales peaked in April and have declined since then. Disentangling the cyclical and seasonal effects is crucial to understanding recent trends. Chart 2, below, shows seasonally adjusted data that are averaged over calendar quarters to smooth out some of the month-to-month variability (the data are seasonally adjusted using the technique described in a previous article). With these refinements, the cyclical pattern of home sales is more evident: After declining throughout 2007 and 2008, sales steadily increased over the course of 2009. The first quarter of 2010 saw a sharp decline, followed by a rebound in the second quarter. Recent data for Arkansas home sales from the National Association of Realtors (NAR), also displayed in Chart 2, confirm the recent quarterly pattern in the adjusted ARA data. The sharp decline in the first quarter of 2010 can be partly attributed to weather. Sales are usually low in the winter months, and this past winter in Arkansas was particularly ill-suited to house shopping. Sales recovered in the second quarter to about the same pace as in the fourth quarter of 2009. But when it comes to assessing the outlook for home sales, the expiration of the home-buyer tax credits is the elephant in the room. Sales in the fourth quarter of 2009 were boosted by last-minute purchases under the original tax credit program for first-time buyers that expired at the end of October. Weather might have kept activity low in the first quarter, but the impending deadline for taking advantage of the extended and expanded home-buyer tax credit on April 30 was undoubtedly a factor in the second quarter resurgence. The recent tax-credit deadline required that a contract be in place by the end of April, but the closing date could be later. As a result, recorded sales in May and June included some transactions that are associated with last-minute contracts to qualify for the credits. The crucial question is whether the second quarter increase reflects sales that would have taken place later in the year in the absence of the tax-credit deadeline — implying that we should expect a sharp decline over the next few months — or whether it reflects a sustainable improvement in market conditions. Preliminary information suggests that we will see a drop-off in the third quarter. New data on existing home sales and new home sales nationwide showed sharp declines in July. Information on home sales in central Arkansas for July show that Arkansas housing market experienced this downturn as well. For example, sales in Pulaski county were reported to be down 30.2 percent from the previous month and down 31.5 percent from July 2009. When the statewide sales figures for July are released by the ARA next month, they are likely to show a sharp downturn. Arkansas home sales over the remaining summer months will probably be relatively weak, as the market returns to an equilibrium undistorted by government subsidies. On the other hand, mortgage rates remain low and house prices have fallen (see below), so the market continues to be favorable for buyers. This factor should help sustain sales later in the year. As shown in Chart 3, below, the two measures of house prices have diverged considerably since the market downturn began, with the purchase-only index showing considerably more variability. Over the past four quarters, the purchase-only index has experienced quarterly ups and downs, but has changed little on net. The all-transactions index has fallen by 2.4 percent. Under either method, house prices in Arkansas have not experienced declines as large as the nationwide average. Over the past four quarters, for example, the FHFA all-transactions index for the U.S. showed a 5 percent decline compared to the 2.4 percent decline in Arkansas. Chart 4, below, compares the two FHFA house price indexes for Arkansas with the average sales-price data from ARA. The series are normalized to take on a value of 1.0 in the first quarter of 2007, so the data presented in the chart show cumulative price changes since that time. Not surprisingly, the average price data from ARA shows some similarity to the FHFA purchase-only index. Both measures are based on prices of actual sales. Both series show a sharp decline in the first quarter of 2010. This drop is associated with the decline in home sales discussed earlier. With fewer homes selling in general, the segment of the market including foreclosures and other distressed sales constituted a larger share of total sales, depressing average prices. With the pickup in market activity in the second quarter, the price spike was also reversed. Cumulatively, from 2007 through the second quarter of 2010, house prices in Arkansas have decline modestly. All three measures of home prices show prices down over the period, but by magnitudes of only about 1 to 3 percent. The FHFA also releases all-transactions indexes for metropolitan areas. As shown in the table below, these data show that house price changes vary considerably across Arkansas’ metro areas. Northwest Arkansas has experienced the largest and most persistent declines in house prices. Earlier in the decade, the Fayetteville metro area showed the greatest appreciation in the state, so declines more recently serve to offset some of those earlier gains. Hot Springs has recently shown fairly large declines as well, but compared to five years ago, prices are up about 14.6 percent. Data for Jonesboro, Texarkana and Little Rock show that house prices increased in the second quarter, with prices also higher than a year ago. In fact, Jonesboro serves as a counterexample to the experience of Northwest Arkansas: Rather than rising sharply in the early part of the decade and subsequently declining, house prices in Jonesboro have experienced a relatively slow but steady upward trend.